Imagine this: "And here's our bus, right on time..."
Starting July 1, Metrobus riders won't be left standing at the bus stop wondering when the next bus will come. At least, that's what Metro is hoping when they relaunch their real-time bus arrival system. 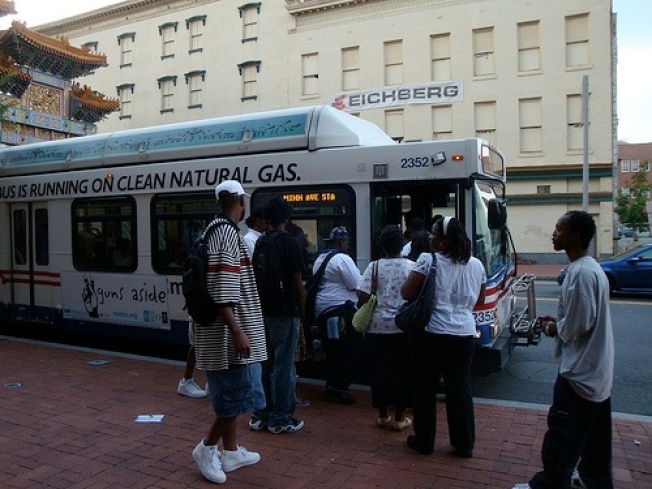 NextBus technology, which uses the global positioning system and computer modeling to track buses on their routes every two minutes, will cover all 355 Metrobus routes and all of the more than 1,500 buses in the fleet -- i.e., approximately 12,000 bus stops in the Metro area, according to The Washington Post. The multi-million dollar system is supposed to factor in things such as the day of the week, whether it's rush hour, or if school is in session, but it's not expected to be 100 percent accurate. The Wash Post reports the system could also be thrown off by snowstorms, road closures and detours. Rob Kramer, the Metro information technology manager responsible for NextBus, told the Post that the system's rollout was delayed two years ago because of inadequate computer capacity at Metro, obsolete databases that didn't include accurate bus stop locations and buses with failing GPS antenna batteries.